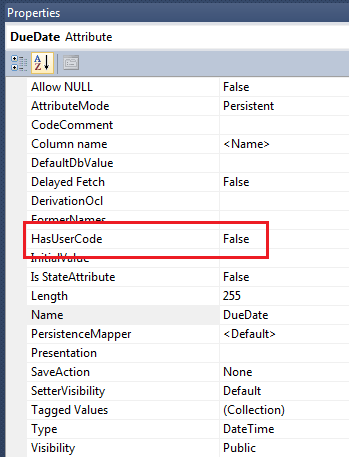 Class Attributes in classes modeled with ECO has a property called HasUserCode. This post sets out to explain what effect the property has and what the intended use is. 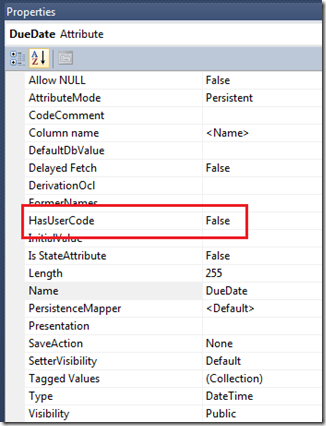 By default the HasUserCode property is false – this says that there are NO side effects or checks applied in code that influence or stop anyone from having the value set. 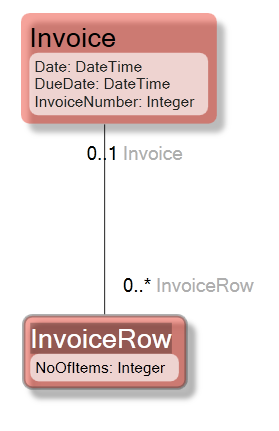 The Invoice class is implemented as a partial class were Invoice.cs is yours and Invoice.eco.cs is maintained by the Framework. As you can see there is no room for extravaganza while setting or reading the attribute “DueDate”. Notice the difference. We now have calls to DueDateReading, DueDateRead, DueDateChanging, DueDateChanged. You – as the developer – may need only one or two of these interception points – but ECO gave you all. Unused Partial Methods are however stripped by the compiler and cost you nothing in runtime. Why not do this all the time? The normal question after having explained HasUserCode is “Why would you ever want to turn HasUserCode off?“. It is a relevant question since the partial methods does not cost anything in runtime – we might as well leave the HasUserCode on all the time… Or? The question is slightly more complex. ECO has the ambition to be as effective as possible and always use the most efficient way to get things done. As a result of this all the internal state of objects is not stored in the frontend object as such but in a centralized cache. This strategy gives us advantages on many levels – like holding object identities before they are fully loaded, knowing what we have loaded or not, signaling changes, ensuring association ends even if not completely loaded, execute models without generated code etc , etc. So when following expressions for subscriptions – created automatically or explicitly, or expressions from ViewModels, Handles, Constraints or Actions – ECO does not really need to route the call thru the frontend object – it can head straight for the cache and cut a few cpu cycles from the workload – it might not be much but since Eco is a Framework these things add up and become important. UNLESS the read or written attribute has the HasUserCode flag set – if it has ECO will always route access thru the frontside object. So does this mean that HasUserCode==true makes my code slower? Technically yes – it will cost you a couple of cpu cycles – so “a lot slower?” No!. You should not worry about that if you need the interception points – but you should leave HasUserCode set to false if you have no intention of using the interception points.